ALPS Mountaineering is an outdoor gear company that was founded in 1993 by Dennis Brune. Before founding ALPS Mountaineering, he ran a different outdoor gear company but he wanted to have more freedom and time to spend time with his family, so ALPS Mountaineering was born. Their mission is: “To create durable, high-performance products without the premium price tag that consumers would expect to find on such high-quality outdoor gear.” They are known for making quality gear at an affordable price that comes with an industry leading lifetime warranty policy. The ALPS Mountaineering Lynx 1 is a single person backpacking tent that comes with a variety of awesome features. In a nutshell, it’s a lightweight, compact, and easy to set up backpacking tent. Is the ALSP Mountaineering Lynx 1 right for you? ALPS Mountaineering 1-person is a high-quality backpacking tent that doesn’t come with the standard high price point of backpacking gear. It’s a free-standing tent with a 2-pole design which offers plenty of space for solo backpacking. The inside of the tent has a base size of 2’8 x 7’6 feet and the rainfly creates a 10 square foot vestibule for storing your extra gear. The upper portion of the tent is made of mesh and the lower portion of the tent is made of Durable poly taffeta floor with a 2000mm coating. There is a D-shaped mesh door that uses extra large #8 zippers on the doors. The inside of the tent has 2 mesh pockets on both ends and clips on the canopy to hang a camping lantern or some clothes to dry. It doesn’t come with a footprint included, however, you can pick one up here. Tents by nature are similar in form and shape but what sets them apart is the features that often go unnoticed. The features that are incorporated into the design are what separates a great tent from a basic tent. ALPS Mountaineering took careful consideration when designing the Lynx 1. Here’s a list of features that ALPS has put into the design to make this tent on par with the best single person tents out there without the premium price tag. This is a 3-season tent that comes with a water-resistant rainfly as an extra layer of protection. The seams are all sealed, meaning that it does hold up in the weather without leaking. There’s not much worse than finding out that you’re tent can’t handle a little bit of rain and that’s not a concern with the Lynx 1. There are mesh walls on the both sides of the tent that give you ventilation and prevent condensation build up inside the tent. There’s also a couple smaller vents that can be opened up for increases airflow in the warmer months of the year. The weight of a tent is always an important consideration, especially if you plan no packing it in. The rule of thumb is the lighter the better, without sacrificing quality and durability. Base weight of the ALPS Mountaineering Lynx 1 is 3.5 pounds, however, that isn’t really achievable since you wouldn’t have any means to pitch it. The actual total weight of this tent including the stakes, poles, carrying bag, and rainfly is 4.25 pounds. A tent vestibule is basically a mudroom for your tent, a place to store your dirty gear and keep the inside clean and comfortable. This are is especially important when looking at purchasing a single person tent. Solo tents are designed to be lightweight and are built just large enough to fit one person inside and nothing more. The vestibule in the ALPS Mountaineering Lynx 1 is about 10 square feet which is surprisingly large. It’s a front vestibule created by the rainfly and gives you a space to keep your bulky gear that requires rain protection. The packed size of a tent is the amount of space that a tent takes up and is directly related to how easy it is to carry. You can get creative and save space by finding other places to store the poles and rainfly to reduce the bulk of the overall packed size. Some people choose to forgo the bag that comes with the tent to save just a couple more ounces. ALPS Lynx 1 has a packed size of 6 inches by 17.5 inches. By splitting up the poles and rainfly into other parts of your bag that have a little extra room, it’s possible to reduce this size even more. Hitting your head when you sit up in a tent is a bummer, no way around it. 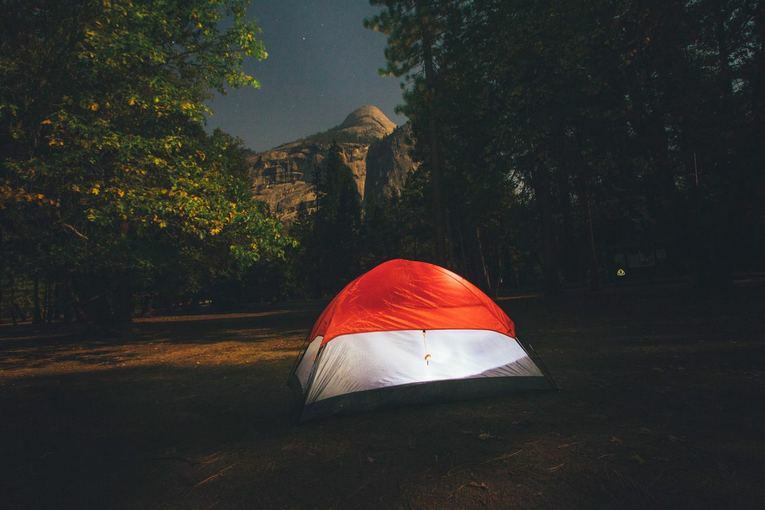 The peak height of a tent is the highest point in the tent and is measured from the center of the structure. Keep in mind, that the peak height is measured from the highest point so it’s not completely representative of the working height of the tent. When choosing a single person tent, you have to assume that the space is limited by nature. The ALPS Mountaineering Lynx 1 has a peak height of 3 feet and this coupled with the wall design gives you ample room to sit up comfortably inside the tent. Wall shape is not often talked about, however, it is just as important as peak height and overall tent livability. The more vertical the walls of a tent the more spacious it feels inside. The walls of the ALPS Lynx 1 have a steep vertical design that provide you with a spacious feeling interior. Steep walls also factor in to making the tent a more weight efficient piece of gear. The Lynx 1 is a free-standing tent with a simple “X” design, in other words, it won’t take you hours to figure out where each pole goes. The tent poles attach together and you lay them in an X pattern over the tent. Each pole then goes into the outer grommet on the corners of the tent. Next, you attach the center hook at the point the tent poles form the X. Work your way down from the center hook, attaching the poles to the hooks on way down the poles. Stake the tent down in the corners with the hooks that are right next to the tent pole grommets. The fly attaches to the tent with an intuitive 4 buckle design, no unnecessary holes, and clips to decipher. There is adjustment points in the buckles so you can add tension to the rainfly as needed. The ALPS Lynx 1 is a lightweight and durable mountaineering tent that provides you with a reliable shelter in the backcountry. The interior size provides you with adequate room to get a comfortable nights rest and the vestibule gives you a great place to keep your gear dry at night. The overall set up process is extremely easy, with only 2 poles and a few connection points, you’ll have it up in under 5 minutes. If you find a better spot after it’s all set up, the freestanding design makes moving it a breeze. Overall, this tent is a great tent at a great price. It’s compact, lightweight, easy to set up, and will keep you and your gear dry.